It's dawned on me just why TfL renaged on the 300 plans as set out in the bus documentation papers. That cull to Custom House and extension to Stratford City cost upwards of £2.3 million; so one can safely assume TfL went into super saver mode when deciding on the 300? The latest proposals are for the 300 to run to Canning Town Station still via Freemasons Road, New Barn Street and Barking Road. It was in the 2014 plans to terminate at Custom House. That number is not quoted in the Network Development Paper. Depending on how TfL structured things the cost could be less than £1m per annum to extend the 300 on to Stratford. The other factor that TfL appear to be carefully ignoring by perpetuating a minimalist scheme is the receipt of nearly £4m in developer contributions from a range of developments in South Newham. There is also the prospect of another £1.5m on top of that number if the Royal Docks development achieves a planned second phase. All that will happen is all that money will sit in local authority coffers doing nothing until TfL decide they wish to spend it. Given how poor the East London changes are that's pretty unacceptable. The same nonsense applies south of the river where Greenwich Council are sitting on millions with millions more due for transport improvements and not a penny has been spent. 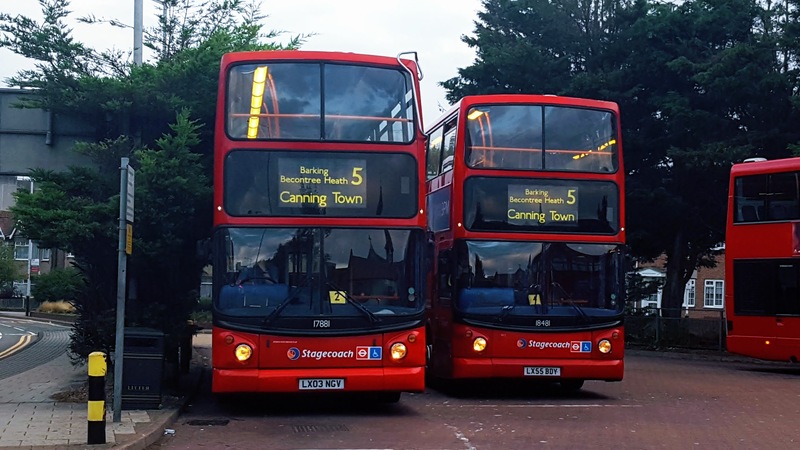 In fact, depending on your view, buses in Greenwich borough will get worse post Crossrail while it is Bexley that at least some level of improvement. My apologies; it was £1.1 million for the extension to Stratford City and £660,000 to up the frequency from 4 to 5pbh. My point still stands; barring the 304 (which isn't costed on the document papers), the 300 is the most expensive change on the list. So if I were to relate cost to TfL's decision to not go ahead with the original 300 change, then it looks clear to me why they quietly dropped the plans. What's this "consultation process" of which you speak? Is it like a flashmob where people turn up at bus stations for a chat? I certainly didn't respond to any of the Crossrail stuff as there was no point and, to be fair, I'm not directly affected by any of it. I think the Consultation process if TfL consulting the public on changes, letting the public have their say, then introduce the changes anyway. Surprised the outcome hasn't been announced yet. Consultation closed 17th September. No work has taken place at Custom House Station (Area still used by Crossrail) so if changes go ahead can see the 241 having to go Prince Regent from May. I think I posted elsewhere that TfL have had a lot of responses (surprise surprise) but expect to publish results "soon". However they have missed self declared deadlines for the Highbury Corner and Highgate consultations and are stupidly late on the 112 (divert away from Ealing Common) consultation. Another department hopelessly under strain due to cuts and loss of experienced staff and, probably, the fact that whatever budget there might have been for changes has probably been removed. As the days loom closer to the bulk of the consultation changes in May, there is still no promising signs of any development to this new bus station at Custom House. Kinda get the feeling Newham council are deliberately sitting on their hands for this matter due to their opposed view of the 241 curtailment from Canning Town. I'm sure at the final hour, TfL will announce 'temporary' running of the 241 to/from Prince Regent bus station. What's got me thinking as a night bus aficionado, is the blatant overbussing at night of the Kier Hardie estate from the N551 and the diverted 474. I hold out some hope as to the N551 being diverted via Silvertown Way; or being very cynical, laying the foundations for the N551 to be scrapped come a night service on the DLR*, and probably making the 262 24/7 to cover the Beckton leg. *Last I remember, DLR night service is 2019, with the subsurface lines the last to be given Night Tube status in 2023. I'd be quite surprised if the changes actually take place in May, what I'm expecting is for all routes to continue as they are with just the 474 changing operator and then for all the rerouting to take place in December when Crossrail opens. DLR night service is not until 2021 at the earliest. There will be no night service during the current concession contract with Keolis / Amey. This is because the contract runs until the end of the PFI contract with CGL for the Lewisham extension. CGL have a load of asset condition / residual life obligations in their contract to ensure they hand the extension back to TfL in good condition and without kn*ckered assets. If TfL were to run night services this would cause extra wear and tear / reduce engineering hours and give CGL grounds to "get out of" or challenge their end of contract obligations. As there is potentially big money involved TfL are not going to give CGL any excuses. That's why there's no night service on DLR for the foreseeable future. I expect the only route that will run initially will be Bank to Lewisham anyway. The other small issue is Bank is being rebuilt through to 2021 too meaning no Northern Line service on the City branch. Given the DLR sits underneath the Northern Line I can't imagine TfL want DLR trains and passengers anywhere near the Northern Line in weekend engineering hours before the works are complete. I actually think it would make sense to swap the routes on contract renewal in May. This way it would mean Stagecoach route learning the new routing of the 474 from day one. Would also save on printing both the old and new destinations of the 241,330 and 474 on blinds. To be honest I feel these changes are more about demand on buses in the Canning Town area being dressed up as linked to Crossrail. I don't see how Crossrail would have any impact on the 241 for example. The very light loadings I have experienced on the 388 I can't see much need to shift the 241 to Here East. Nor when there is also the Here East minibus shuttle. I suspect the 241 extension is dead in the water in the context of funding cuts / Hopper ticket. It's pointless as things stand.